Audi has launched the revised A1 which gets more standard equipment, styling updates and new engines including a 1.0 TFSI petrol that's shared with the latest Volkswagen Polo. 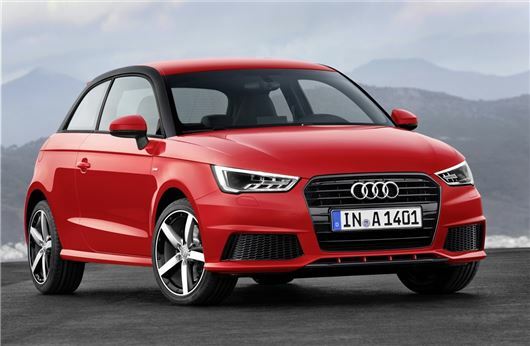 The updated A1 and A1 Sportback models are available to order from later this month with the first cars arriving in spring 2015. Exterior changes are minimal and include a flatter and wider grille, new bumpers and redesigned standard alloy wheel designs. There are also new colour choices. In spring of 2015 a new 1.0 TFSI three-cylinder petrol engine will be introduced. Shared with the latest Volkswagen Polo and the Up, it replaces the 1.2 TFSI but has more power with 95PS and will be capable of a claimed 60mpg with CO2 emissions of 99g/km. The other petrol engines include two improved versions of the 1.4-litre TFSI. The standard model has 125PS while CO2 is down from 124g/km to 115g/km. The cylinder on demand model now has 150PS. The 1.6 TDI continues as before but with official economy improved from 74.3mpg to 80.7mpg and emissions cut to 92g/km. For the first time all models, including the 1.6 TDI, will be available with an optional seven-speed S tronic automatic. Under the skin, the steering has been retuned and the new electromechanical system designed to provide optimal assistance in all driving situations. A new suspension option including adjustable dampers is now available for Sport models and above. It allows the driver to vary the steering and suspension across three modes – auto, dynamic and efficiency. Inside all cars get extra chrome and gloss black detailing, new upholstery choices including an Alcantara and leather blend plus more upholstery colours, such as Laser blue for Sport models and Rotor grey for S line models. Sport models now include Audi drive select plus the Audi Music Interface and preparation for SD card-based navigation. S line versions get standard xenon headlights with LED daytime running lights and LED rear lights. My A1 TFSI was poor for average fuel economy, overpriced without any helpful Main Dealer discounts, extras were expensive and generally the A1 was no bigger than a mini, only saving grace was it was quite nice to drive, hope the revised versions are some what better, as I got rid of mine after 8 months from new after waiting 3 months for it to be delivered, into the country..